For 2008 BMW improves its already famous and impressive K 1200 GT, a motorcycle which is the leader of its class thanks to a marvelous performing four-cylinder engine displacing 1200cc. Like any sport-tourer, the K 1200 GT is best characterized by its ability to offer one hell of a ride while keeping thinks easy on the rider as it offers great comfort thanks to a low seat and high-mounted handlebars. The fact that these units are both adjustable radically contribute at leaving the competition well behind. A combination of refined styling, hard-hitting power and all-day comfort, the BMW K 1200 GT is an inviting bike always ready to leave the State with you on its saddle. 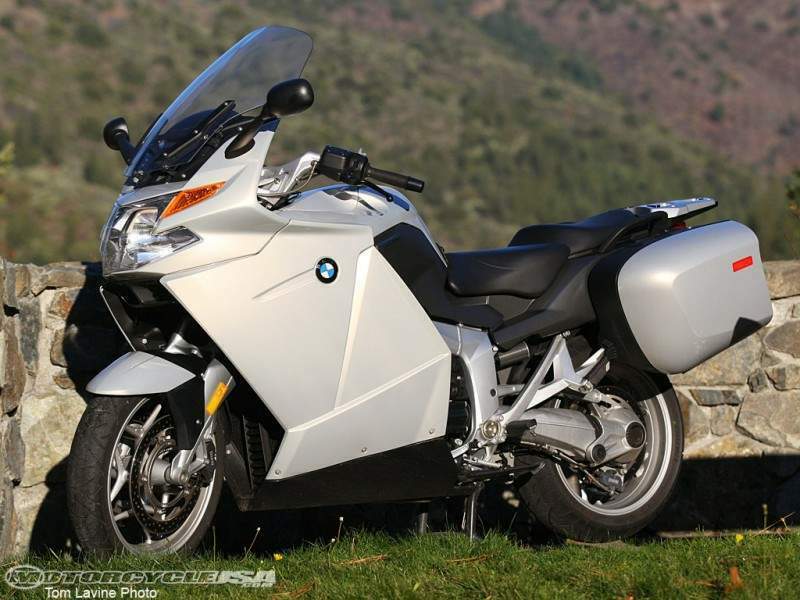 It all started with the introduction of the BMW K 1200 S in 2004. It was the German manufacturer’s closest thing to a supersport Japanese motorcycle as it featured a revolutionary inline four-cylinder engine which two years later was to find its way on the brand new K 1200 GT a brand new sport-touring BMW motorcycle. The new bike was highly acclaimed by the motorcycle press as it was very unique and, in fact, not very different from the one that we’re talking today. An immediate success, the GT version of a European supersport bike goes strong today as for 2008 it gets a narrower design. It is clear that BMW felt like having a piece of the Japanese’s cake when it introduced the K 1200 GT and success couldn’t have come in higher levels. Even though people tend to position the Hondas, Yamahas and Kawasakis in a class of their own, BMW manages to see its way in this highly competitive class and even lead it. The Honda ST1300 is a very powerful and aggressive-looking motorcycle powered by a reliable 1261cc liquid-cooled longitudinally mounted 90 degree V-4 engine. It features a five-speed gearbox which is the most appropriate for this type of engine and for what a rider will need on its trips around the country. The BMW features a six-speed gearbox but who am I to judge? Also in the fight for the perfect sport-tourer is Yamaha with its beloved FJR1300A. This time we’re facing a 1298cc liquid-cooled inline 4-cylinder; DOHC, 16 valves engine which bigger than the one found on the BMW and it features the same configurations, but it doesn’t quite develop the same amount of power (a claimed 145 horsepower). Kawasaki has always kept the cylinder capacity upper than most of the manufacturers and it does no exception for this class as the Kawasaki Concours is equipped with a 1352cc, liquid-cooled, DOHC, four valves per cylinder, inline four with VVT engine. This makes it the biggest sport-tourer, not necessarily the best. It is clearly on of the strongest competitors of the GT, though. While Japanese builders try to keep their bikes as slim looking as possible and implicit more aerodynamic, the K 1200 GT makes a small compromise in favor of comfort. The subject of this review offers the best wind protection of them all and it is due to its generous fairing and windscreen, elements which are characteristic to the Bavarian builder. Even is the manufacturer would have tried to take it easy with the large fairing, four-cylinder inline would have still determined an imposing looking motorcycle and things have stood pretty much the same so why not go for the entire package? The headlight and signal lights are nicely incorporated in the front fairing reminding us where this bike inspired its creation (on the K 1200 S). 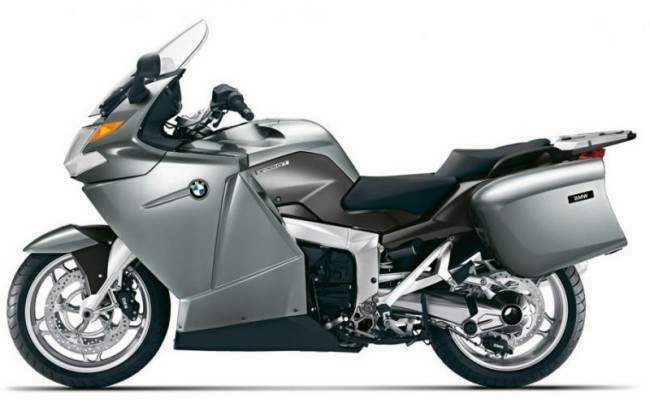 Side fairings are relatively simple and the BMW emblem on each side announces that this is no ordinary motorcycle. A six point three gallons fuel tank is pretty impressive and its sharp lines are the ones that make things a bit more stylish if we take in consideration the fact that they are continued on the side fairings. The rider’s seat is a place of honor so it is kept as low as possible for a better feel of the bike and more control over it. Also defining for the touring look are the side cases painted in the color of the bike which can be either Aventurin Silver Metallic, Dark Graphite Metallic, or Deep Blue Metallic. I was introduced to the BMW K 1200 GT in an unfriendly environment for this kind of motorcycle, the city. My options were fairly simple: either I was going to keep the bike at 15mph and my eyes always on the mirrors or I would take it outside town where all the fun begins. It isn’t extremely hard to ride it through traffic jams, but given its dimensions, the side cases and the impressive engine, it would be a waist of time and energy to try and get something out of it in these conditions. Heading out of town I noticed that the 1157cc traverse mounted, liquid cooled inline four-cylinder engine delivers its power smoothly and pretty strong even from down low. The potent exhaust note also made an entry, letting me know that I’m dealing with an angry mechanical horse. And it was true. On the freeway I noticed that the engine pulls best between 6500 and 9000rpm, leaving any other form of motorized vehicle well behind. Also while I was enjoying a wide open throttle, situating the speedometer’s needle at 160mph, I found myself incredible well protected by wind and the cold rain that this time didn’t managed to ruin my day. Everything that is related to comfort on this bike is adjustable: seat, handlebars and windscreen. It is understandable why a rider is simply delighted by the riding position and the protection offered by the fairing and screen as it doesn’t disappoint in any of the mentioned aspects. Going through the six ratios of the gearbox was no problem whatsoever because this unit is very precise making shifting a piece of cake, but what I appreciate more is the smooth clutch. You can’t even feel when the clutch disengages, the only sign being the fact that the bike goes strong and the needles start to change positions. This is one serious motorcycle that needs to be maneuvered with maximum care and attention so experience helps a lot. Considering that 549lbs have to be leaned in order to take corners, the rider would have to put some pressure on the handlebars and confidently lean over and then raise the bike with the help of the throttle. I find the GT very stable both at high speeds and while strongly braking and that is mostly due to the new BMW Duolever front suspension and the aluminum frame. Even though it doesn’t feel exactly like a supersport bike, it is strongly related to one not only by name, but by engine and chassis too. Instant power is available a twist of throttle away thanks to the electronic fuel injection system. The engine is tuned for touring so that and the weight are pretty much the impediments towards braking the world speed record. Even though it won’t do that pretty soon, it still needs reliable brakes for those emergency stops so BMW uses its EVO system which implies partial integral ABS, four piston caliper up front and two at the rear. While riding the bike fast through corners (something that I don’t recommend) with more than one occasion you will need to hit the brakes powerfully and that’s when it will hit you. BMW knows how to get things done as effectively as possible. Always use both brakes for greater stability and more efficient braking. For riders who don’t feel like going with the crowd BMW offers an exclusive alternative (probably thanks to its price tag) derived from a true supersport machine in the true meaning of the word. The levels of performance and comfort are the highest and, you’ll agree with me on this one, styling is very attractive also. What more could you possible ask for?